Check valve inline R1/8 con. - 6mm. Check valve inline R1/8 con. - 5mm. 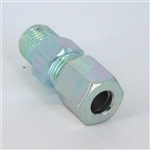 Check valve M10x1 with female 1/8NPT thread for use in divider valves.